Anyone who has any working knowledge about agriculture understands it is a vocation unlike any other in the United States. We are lucky to be alive! If you have lived in the era from 1949 to present day, you have lived in the most exciting period in American agriculture. Even if you are just old enough to be aware of the period from 1972 forward, you really have lived in the entire era of modern agriculture. Joe Berkely was the original publisher of High Plains Journal. He purchased the Dodge City Journal with another partner in 1945, then changing the focus to agriculture and renaming the publication High Plains Journal. There can be no discussion of High Plains Journal without talking about its founding publisher of 44 years, Joe Berkely. 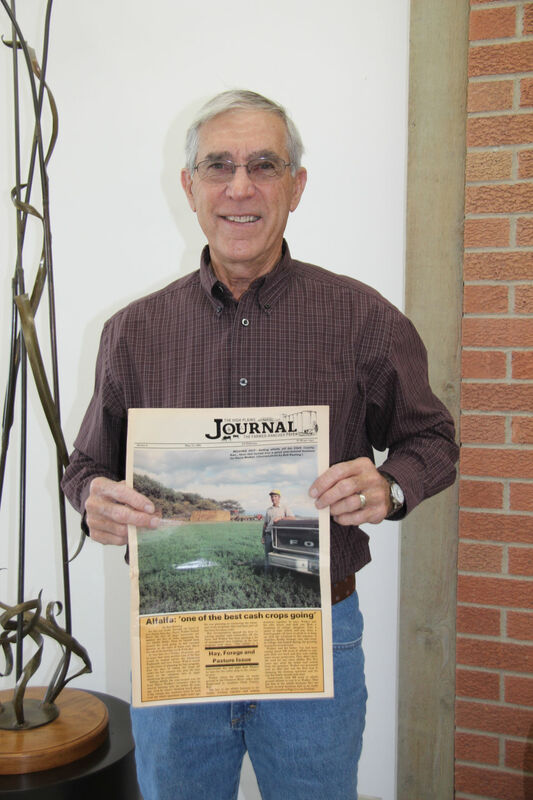 When the idea of High Plains Journal readers taking pictures with old articles of themselves in honor of the publication’s 65th anniversary came up, this reporter had to call on the subject of his first story for the publication 25 years ago. What do you get when you put a retired publisher, a retired editor and two senior field editors around a table for an hour and a half? For as long as I can remember, there was always a subscription to High Plains Journal at our house. I wasn’t entirely sure whether the word “nostalgia” was a good one or not, and after consulting the dictionary I’m still a bit baffled. I think I have some nostalgia, and I think there is a lot of it in our industry, but it seems to be a bit of a two-edged sword. In this 1983 photo, then Managing Editor Galen Hubbs works at his desk while Publisher Joe Berkely and Editor Ray Pierce look on. Randy Weaver holds a a copy of a canceled subscription check to High Plains Journal for $3 written in 1964 by Weaver's father, M.K. Weaver. Their family's farm is east of Buffalo, Oklahoma. Harry Walker, Englewood, Kansas, appeared on the cover of on May 13, 1985. The article outlined his emphasis on alfalfa on his Clark County farm. After the article was published, Walker says he received calls from all over the subscription area inquiring about his hay. Walker retired from farming two years ago and his son, Rick Walker, is now running the farm. Daryl Strouts submitted this photo for #HPJ65 of his father, Lawrence Strouts, who appeared in the July 8, 1991, issue. Rex Haltom, formerly of Coldwater, Kansas, sent in his #HPJ65 selfie. He was featured in a Nov. 21, 1977, cover story about rotational grazing. For 65 years, High Plains Journal has shared stories of farmers and ranchers doing innovative things on their operations. Many of these techniques, once revolutionary, are now part of High Plains agriculture. High Plains Journal Associate Editor Kylene Scott shared her #HPJ65 selfie with her dad, Valere Orebaugh, and her son Shaun Scott, along with the ad in which Valere appeared in for John Deere in the July 4, 1977, issue. The news you need, when you need it, by the editors you trust. Get continuing news coverage and educational information on crops, livestock, soil health and other topics you select. Join Associate Editors Jennifer M. Latzke and Kylene Scott every week as they chat about the news, HPJ stories, markets and more.